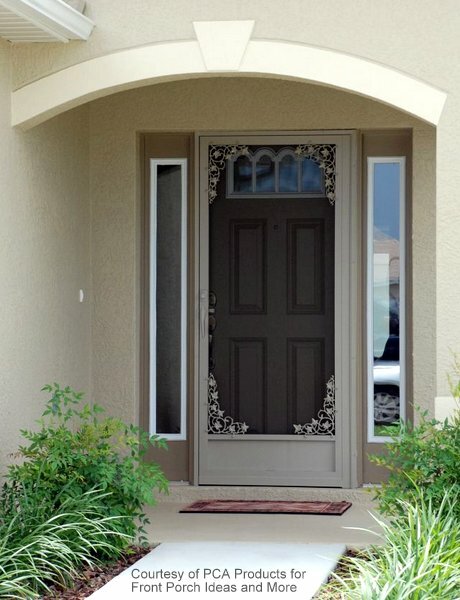 An attractive custom aluminum screen door instantly adds appeal and value to any home. 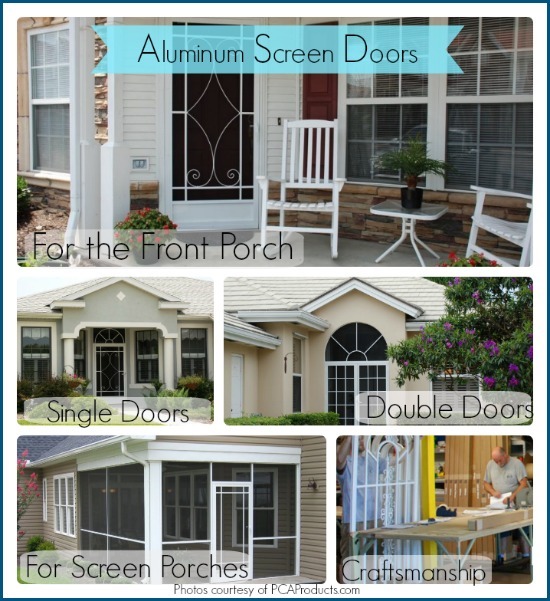 Not all aluminum screen doors are the same. If you are looking for beauty and durability, Mary and I are happy to tell you about the doors from PCA Products (one of our fine sponsors). 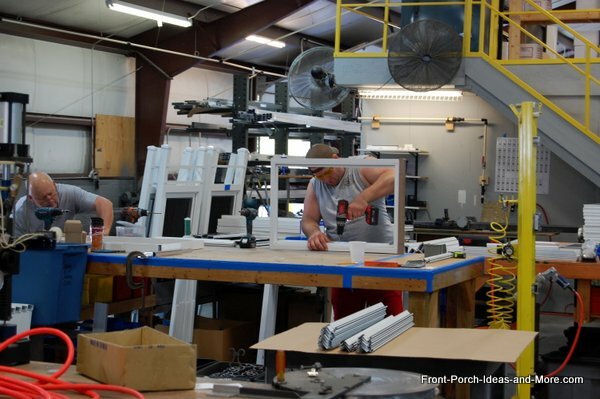 The design and engineering that goes into making a screen door from PCA Products is noteworthy. Mary and I toured their manufacturing facility to see the entire production process. 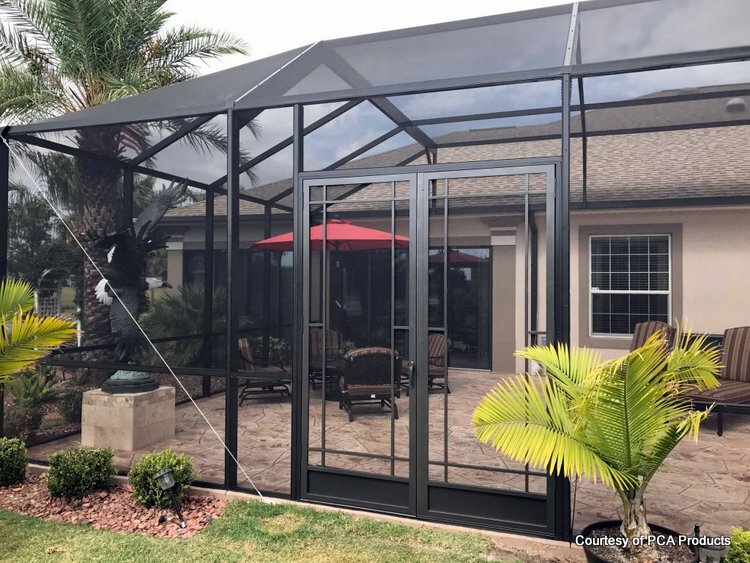 Although we do not know specifically how other manufacturers construct their metal screen doors, we can attest to the quality and engineering that goes into a PCA Products screen door. 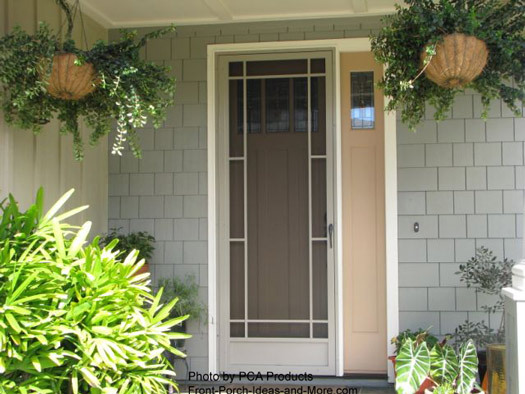 You can make a statement with a beautiful exterior screen door like these from PCA Products. PCA Products is one of our sponsors and we are proud to tell you about their aluminum door products. 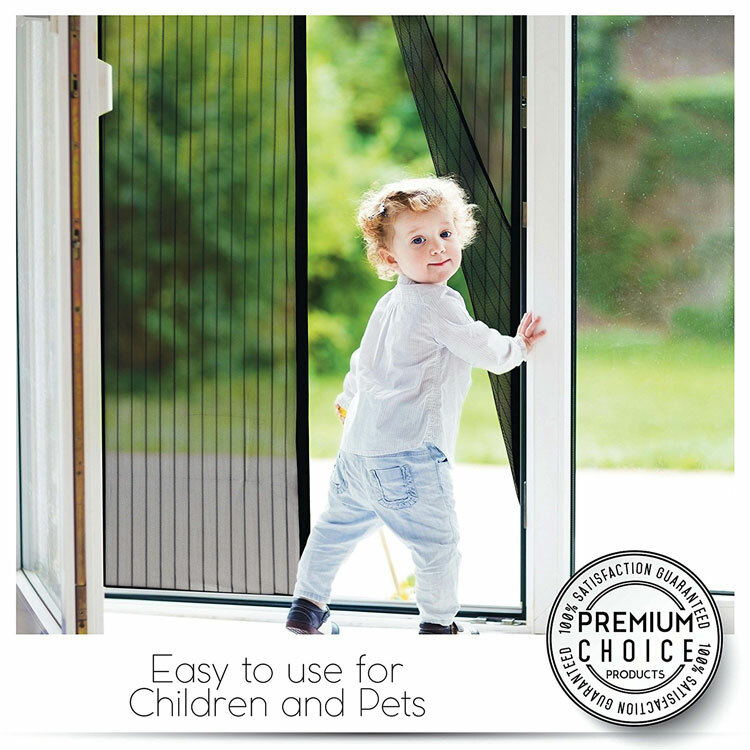 We have personally seen their products and appreciate the construction of their screen doors. We like the fact their metal screen doors are designed to alleviate what most people find most annoying in a screen door. 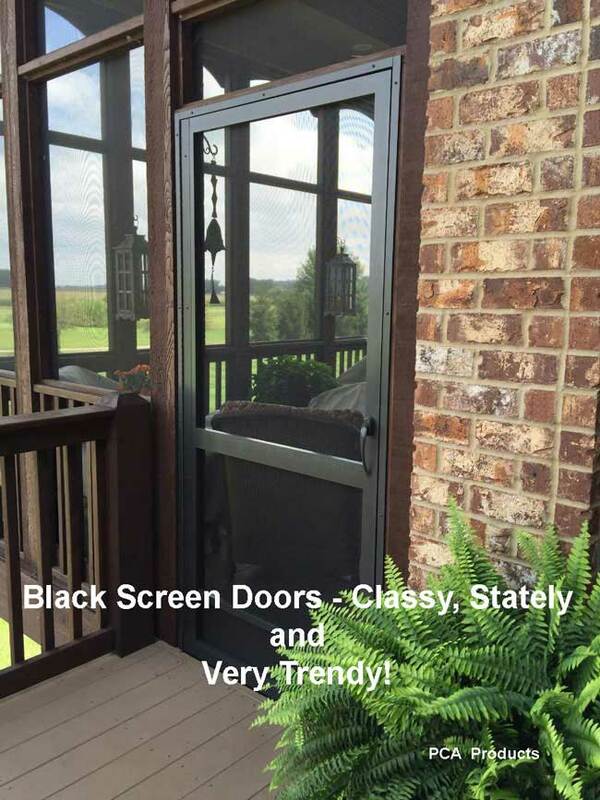 We are excited that PCA Products is now carrying their screen doors in black. 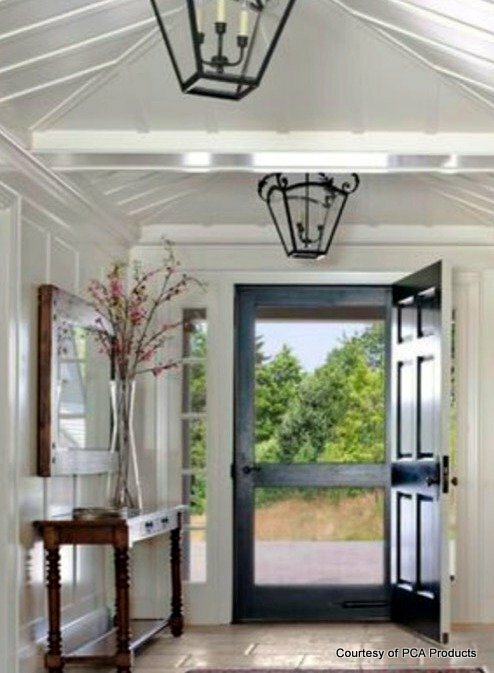 Look how classy this front entryway is! And from the inside too. Sophisticated and timeless. These wonderful doors are available at PCA Products. 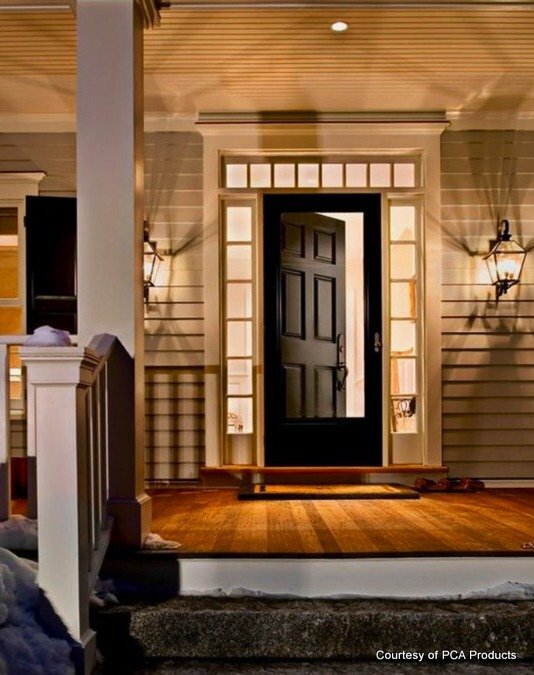 Please read their article about how black doors have become quite trendy and popular. Please take a moment to listen to Steve Pfeffer, President, as he explains the features of his PCA Products screen doors. Be Done with These Door Annoyances! PCA Products has addressed these annoyances in their door design and construction. Not all aluminum screen door frames (the most critical part) are the same. Ensure the frame is manufactured to the highest standards. 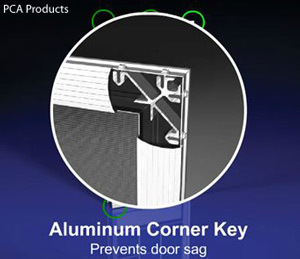 As an example and for comparison purposes, PCA Products' doors are made with internal corner key systems as shown at right. In addition, their screen door frames are .065 inches thick and have a continuous piano-type hinge extending the entire length of the door thereby creating a solid connection between the door and the door frame. They also developed the Thru-Lock System™ which means no unsightly welds and stronger overall frames. Together, these important construction factors eliminate door sag and twisting compared that with typical home supply store screen doors. Loose screens definitely are annoying and you can never seem to get the screen as tight as it was originally. If I were to solve that problem I'd create a system whereby when you pushed on the screen it would actually tighten, not loosen. But I discovered I was too late with that idea. PCA Products' screen doors are built to do just that. They use a flat locking spline system that keeps the screen tight; it won't come out. There's nothing more aggravating than having the screening on your screen door tear. Patching it with duct tape is not appealing. If you have pets, children or grand children, chances are your screen needs to withstand some rough wear. So you need options. Select from standard screening or if you prefer, their Super Screen. If you have pets choose their pet screening material. A quality aluminum screen door should be easy to install taking the guesswork out of how it is supposed to fit in your opening. What if it didn't matter whether you need a left-hand open out door or a right-hand open in screen door? And how many times have contractors brought the wrong door only to have to reschedule the appointment? Look for a door that gives you more options, opens either way, and even adjusts for height and width to make a perfect fit in your opening. For the DIYer, I find these doors easy to install. Understanding that not all door frames are perfectly square, PCA's doors are adjustable to fit the space making it not only easier to install but also making it very attractive fit. You don't have to cut your new door to fit your opening as you would with vinyl or wood screen doors. Now you won't have to struggle with tightening your screen while trying to push that round rubber spline back in place while hoping it holds. 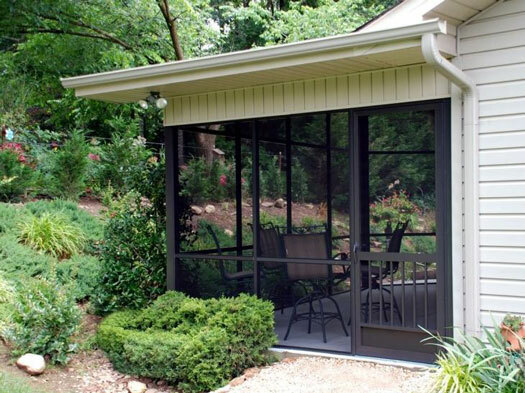 Stylish, curb appealing, and functional, an aluminum screen door is ideal in almost any location on your home. 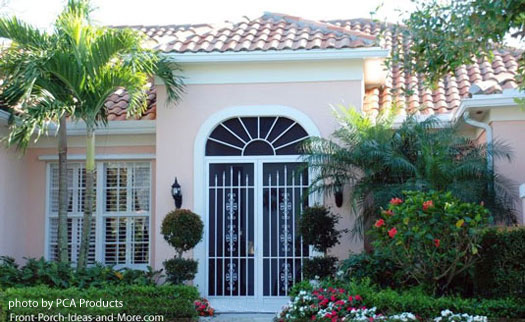 It is pleasing to maintain the architectural look of your home when adding any new exterior feature. Installing a custom designed aluminum screen door makes that easy to do. In the photo below, note how the metal screen door insert mimics the architectural lines on this home, from the siding to the light panel to the right of the front door. Who wouldn't love calling this home? 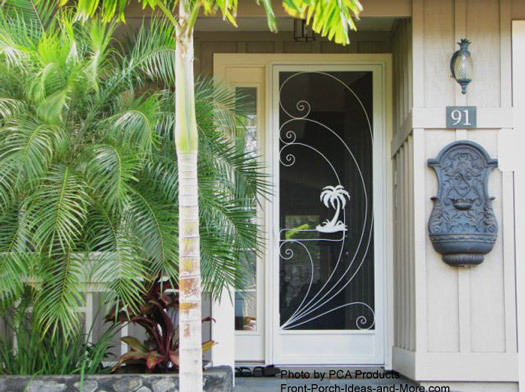 The owner of this home included a tropical insert from PCA Products on their screen door to complement the palm tree landscaping. 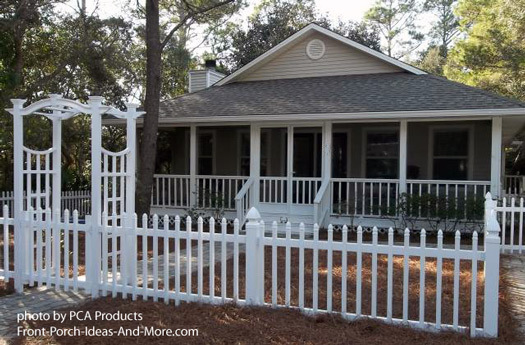 Such an easy thing to do and it instantly increased the appeal of their front porch. You may not find the right style option at your local home supply store among the few they may have on hand. But don't despair, PCA Products has many styles from which to choose. We invite you to look at PCA Products site to get the information you need. The only moving part on a screened porch or porch enclosure is the screen door so it needs both durability and appeal. 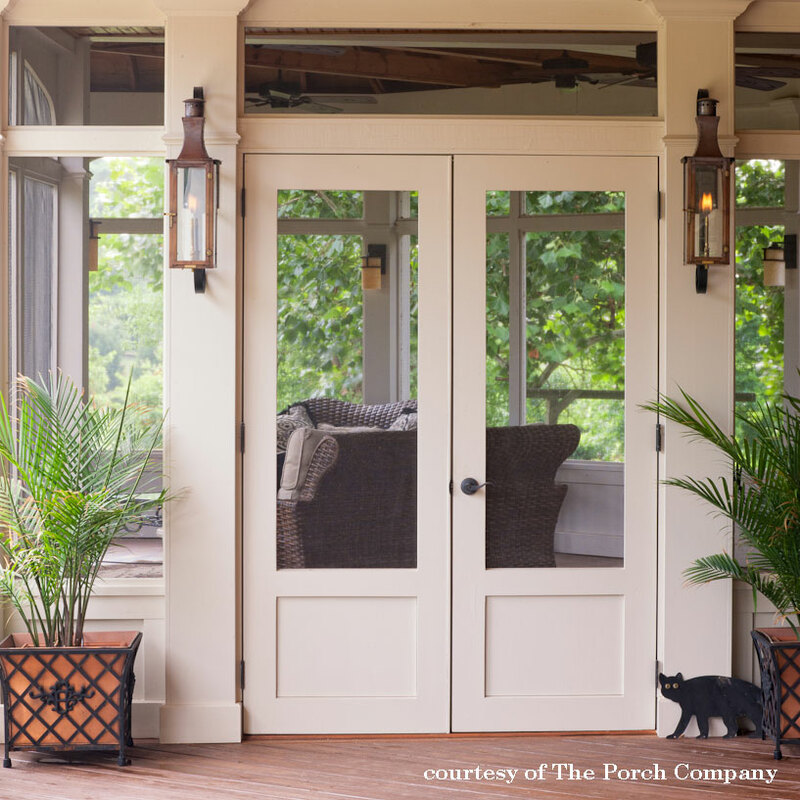 If you are building a new screen porch or erecting a screen porch kit, you need to learn more about PCA Products' doors. 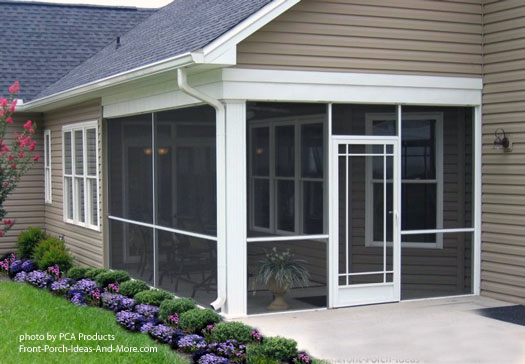 They have teamed with ScreenEze® as a way for you to construct an amazing screen porch. 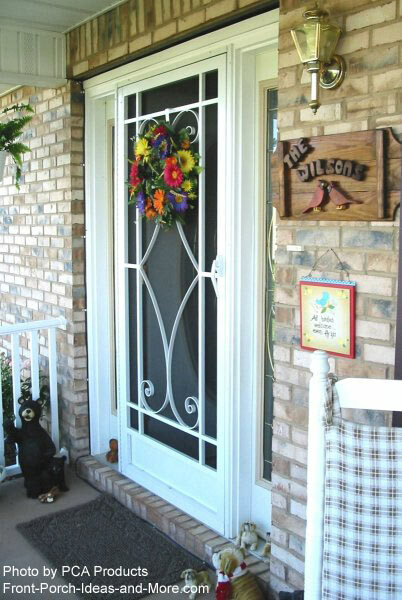 This is a good example of a PCA Products exterior screen door on screen porch kit. 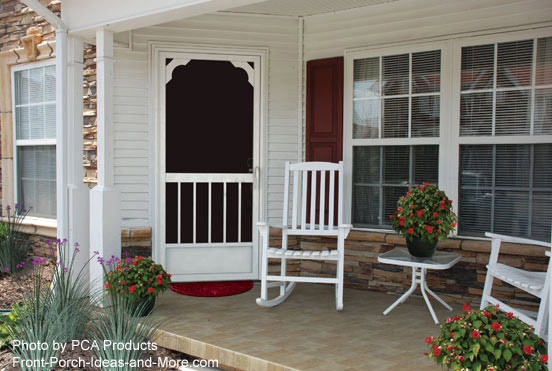 Enclose your front porch or lanai with PCA Products screen doors to enjoy your porch even more. 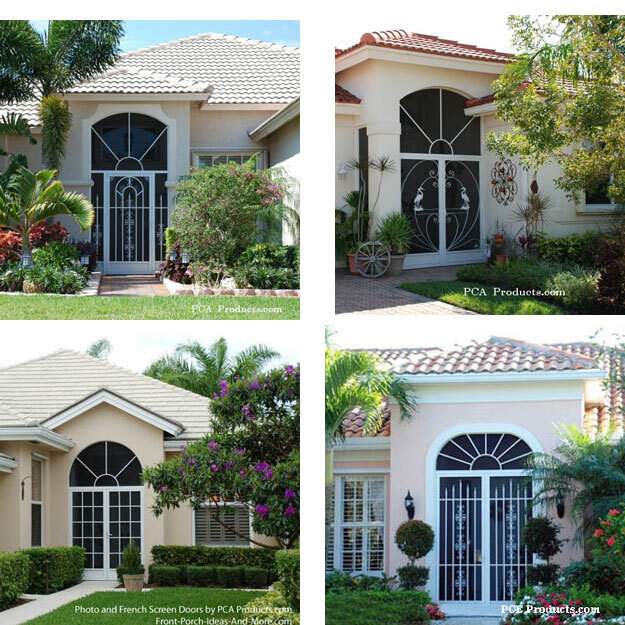 With over 65 door styles and 5 colors, you can easily enclose your structure with single or double screen door entry enclosures. Their sidelight and sunburst inserts allow you to customize in your own decorative way. Let PCA Products Help You Today! Now that you know how many ways in which to use aluminum screens doors from PCA Products, find out how you can add appeal and functionality to your home today! Some people don't realize that they could have French screen doors on their porch or patio. If you are building or renovating this is an option you may want to consider this option. It is great for entertaining and moving large pieces of furniture in and out. 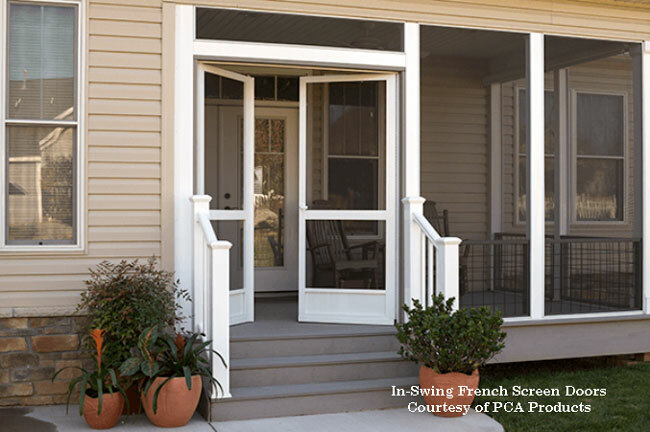 PCA Products' innovative French Screen Doors give you options you never had. Prior to PCA's product, your only option was to install a bar between the screen doors or install screen door sliding systems. Either of the traditional options often diminish your view which is why you have French doors - to take advantage of the view. Now you don't have to be limited to a bar or a sliding system. 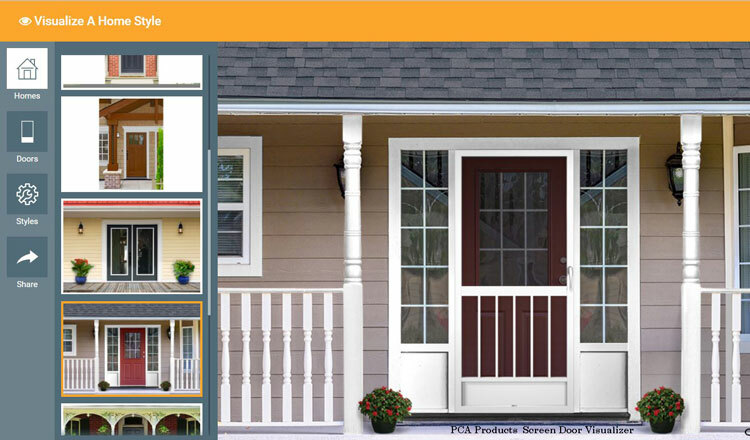 We invite you to look at PCA Products' French door to get the information you need. French screen doors must be able to open fully to allow for the view but also close securely too. 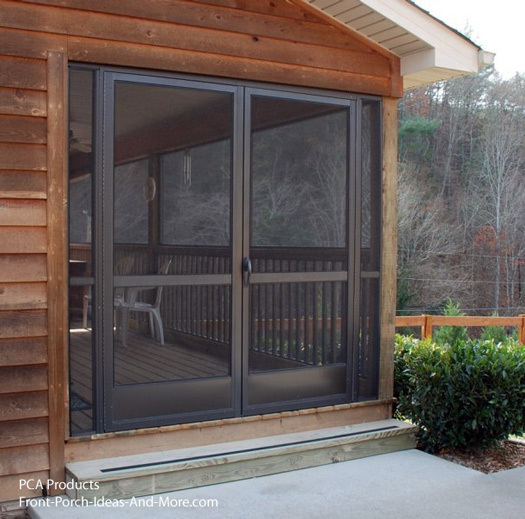 PCA Products' French screen doors use an astragal system to create a good seal, privacy, and to minimize outside noise and light between the screen doors. Two flush bolts allow for an unobstructed opening. Because they are flush at top and bottom, the "fixed" screen door can be opened or closed easily. 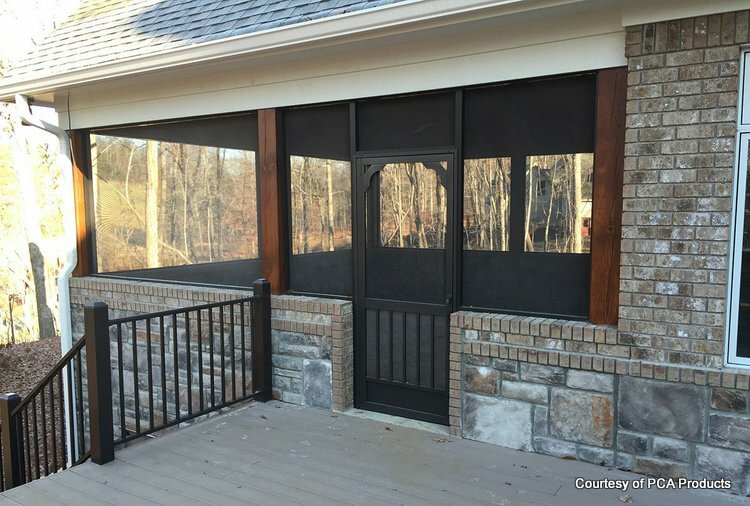 Have You Thought of In-Swing Screen Doors? For porches and patios that have steps, you may want to have your screen door installed to swing into the room for convenience and safety, especially if you do not have a landing. This awesome tool lets you see how each screen door design looks a home. You may be pleasantly surprised at how different a home can look based on the design you choose. No more guessing whether your door will have the effect you want - now you'll know! Why Not a Pet Screen Door? 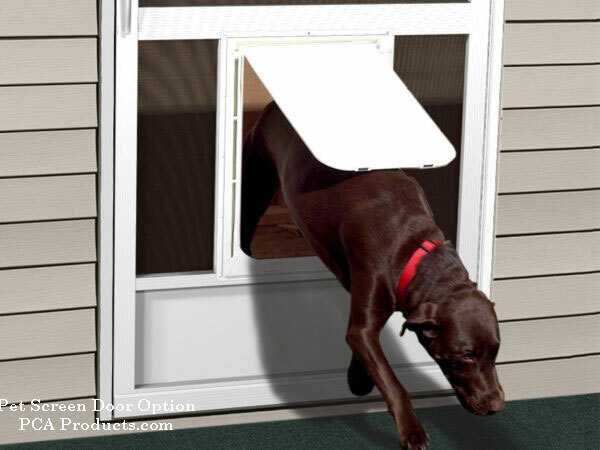 Pet doors can be configured into the bottom of your screen door. This adds convenience when you want to be able to allow your pet to go in and out without having to let them out. They also come in three sizes! Wouldn't this pet screen door be a big help? You can even design your door with pet screen on the bottom and standard or Super Screen on top. The heavier the screening material the less transparent it becomes. Pet screening is woven tightly to prevent tears and therefore is darker than standard screening. 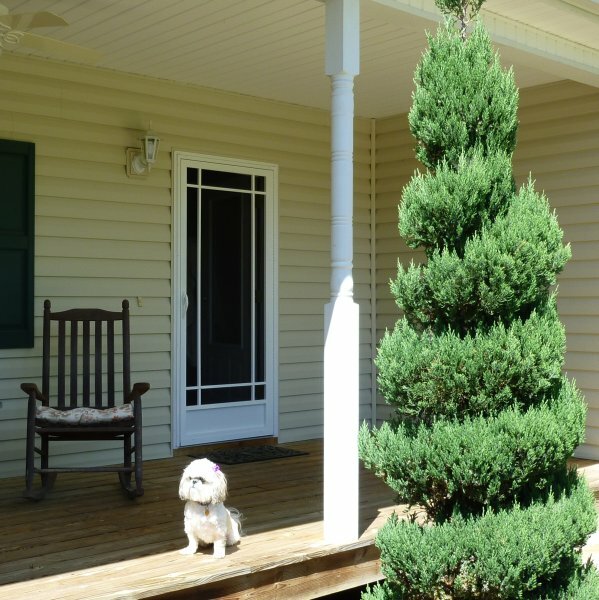 By using pet screening on the bottom of your screen door and standard or Super Screen on top, you maximize the light and view while simultaneously protecting integrity of your screen. 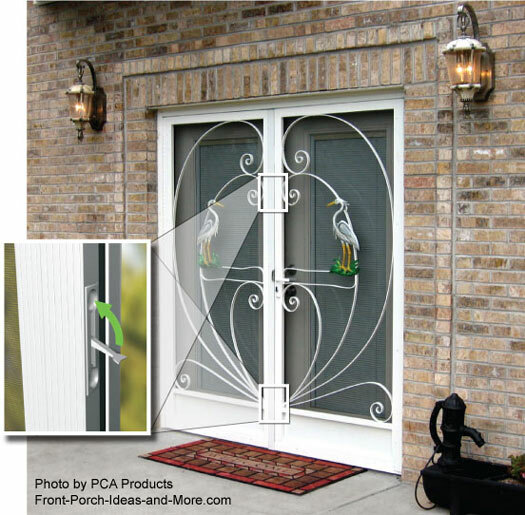 You can even go a step further and have PCA Products incorporate a pet door in your screen door. 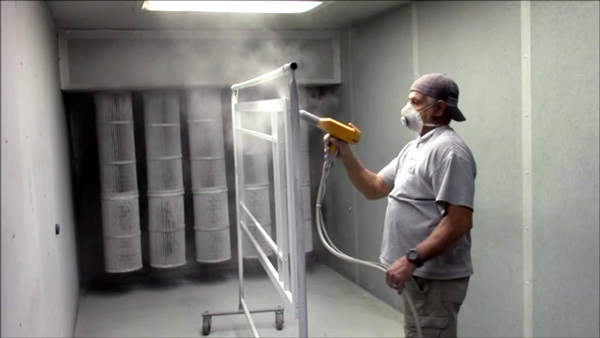 "What really makes our products stand apart from others is that we powder coat each door by hand after fabrication. You get a much better finish. We're not using machines to do this. It's all being done by hand so you get a good visual and it makes for a nice long-lasting durable finish. One of the corners we could cut is that we could use painted profiles and just put up painted profiles, but you could end up with scratches from fabrication where [with the way we do] it you getting a great finish. Of course, this powder-coated finish is really designed for the harsh outdoor elements which translates to over 10 years of durability." 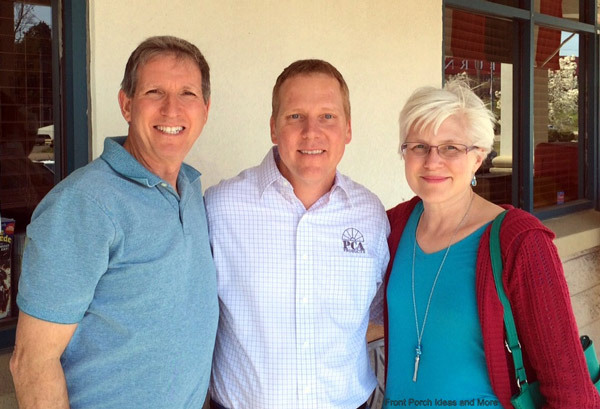 Steve Pfeffer tells about his custom screen doors on our audio program. Full details here and for your convenience you can listen right here. 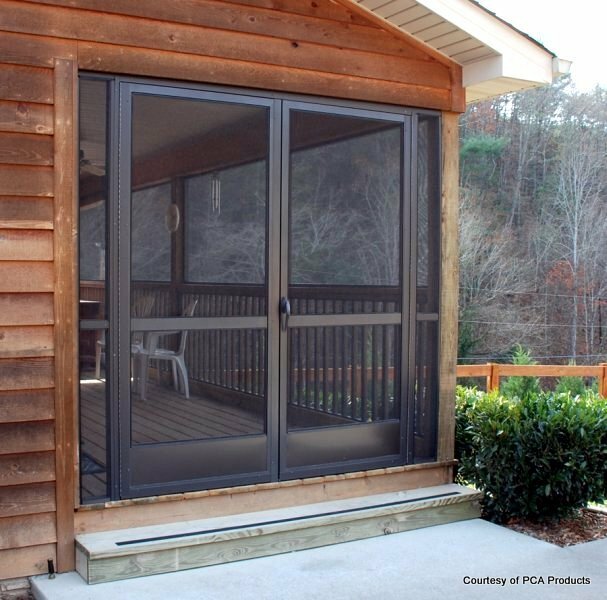 PCA Products, Inc. a family-owned business located in Eastern Tennessee, has been making handcrafted aluminum screen doors and enclosure accessories for over 25 years. Their phone number is 800-567-8897. 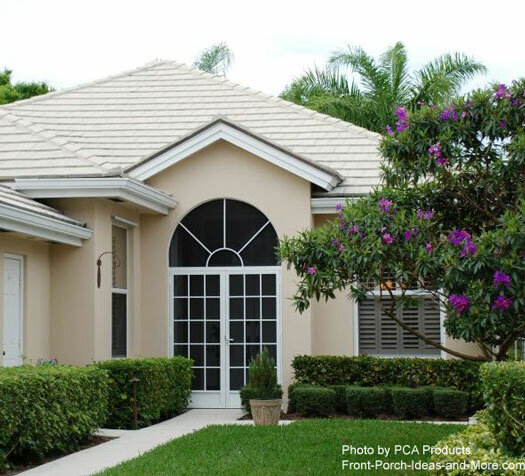 PCA develops a wide range of screen doors and screen door products to satisfy homeowners who want both style and durability. PCA expanded its operations from not only manufacturing and selling directly to the public but also to wholesaling through a Partner network. Mary and I encourage you to contact the good folks at PCA Products today. They can answer all of your questions and help you design a screen door to enhance the beauty of your home. 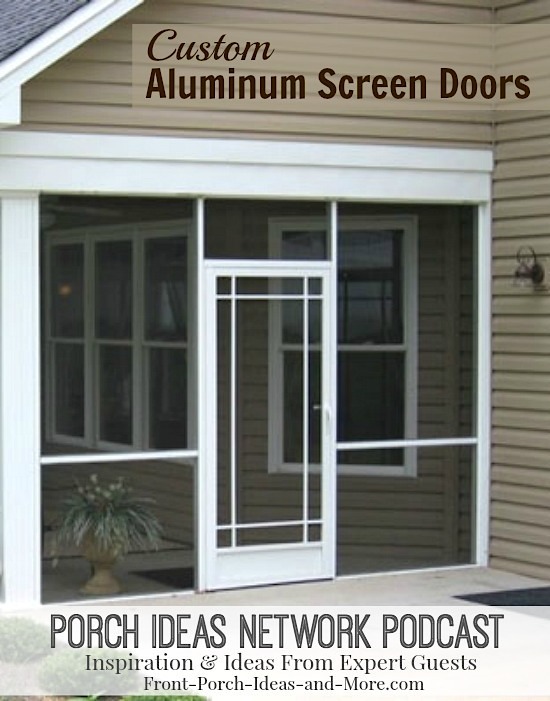 You will enjoy using their screen door design tool, too. Dave and I recommend investing wisely in a high quality metal screen door to receive years of almost free maintenance, beauty, and durability. We've only addressed a few of the issues most screen door owners have faced over the years. Mary and I know that an aluminum screen door from PCA Products is the answer for many. We encourage you to contact them today to see how you can acquire one of the best aluminum screen doors on the market. They are just a "click" away!